Things I Can't Explain is about knowing it all in your teens and then feeling like you know nothing in your twenties. Oh a book that is a sequel to such a loved children's show, I definitely jumped at the chance for this. Though I may be a bit young, I know of Clarissa Explains It All from watching what my sister did. I have a few memories about this show, but I can definitely say that a lot of things came back as I was reading this book. 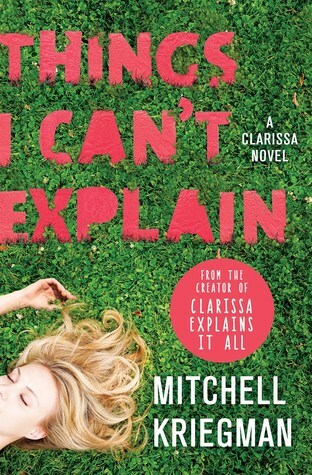 Now don't get me wrong, you really don't need to know the show to enjoy this book, Mitchell Kriegman brings in a lot of Clarissa's back story to explain how she has gotten where she is now. It's great to see the story of Clarissa grown up and is dealing with a new life away from where she grew up. Kriegman does an amazing job bringing Clarissa back to life but is now at an age where those who grew up with her can relate to some of the issues she is going through. I love how Kriegman shows the difficulties of going out on your own and starting life, nothing can be perfect, there are always problems that need to be solved before things begin to fall into place. I love the writing style, Clarissa is definitely back and she is still a force to be reckoned with, readers still get this sassy girl who is obsessed with charts and graphs and it helps her control her world around her. We get a glimpse of Clarissa's parents who definitely bring some great humour to the story and throw a huge wrench in some of her plans. It's great to see how Clarissa's past really shapes her future self and the people that she has befriended over the years, including old friends. You can't have a book like this without bringing back so many old characters, and it truly adds to the story to see these people come back and still have an effect on Clarissa. Honestly this was such a cute book, though I am disappointed that there are certain people who seem to be missing. Maybe it has more to do with Clarissa moving on with her life and getting away from her past but it would have been nice to have a little more of a certain someone... This is definitely a great sequel to an awesome show from years ago (and I can definitely picture Melissa Joan Hart flawlessly pulling off the roll of Clarissa in her twenties). Doesn't matter if you were a fan of the show when you were a kid or you're just looking for a cute read that will leave you laughing as well, this is for sure a book to pick up!